Addis Ababa, 10 May 2018 – More than 100 child rights experts, advocates, defenders, campaigners, policy-makers, lawyers and academics are calling for action to make access to justice a reality for all African children. 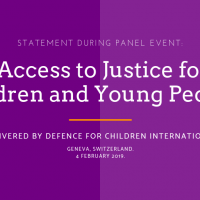 The Call to Action came at the close of the Continental Conference on Access to Justice for Children in Africa, organised by Africa Child Policy Forum (ACPF) and Defence for Children International (DCI). Participants heard repeated warnings about the adverse and lasting impact that failure to access justice has on children in different contexts across Africa. Despite some progress in recent years, the Call to Action makes clear its concerns that children remain predominantly invisible in the justice systems in Africa; that some groups of children have specific needs because they are in particular situations of vulnerability; that action is needed to bring laws and policies in African countries in line with international standards and principles; and that access to justice for children urgently needs more resources and better coordination between governments, civil society, international agencies and academics. A new report launched at the conference, Spotlighting the Invisible: Justice for Children in Africa, reveals how thousands of children across the continent are denied access to justice, and paints an alarming picture of discrimination, inadequate funding, poor training, unaccountable informal justice systems and slow progress on children’s rights. The Call to Action lists a number of ways the different institutions and stakeholders involved – African governments, the African Committee of Experts on the Rights and Welfare of the Child, non-governmental organisations, United Nations bodies, academic institutions and development agencies – should speed up the fulfilment of access to justice for children. “Many African countries now have laws and standards to protect children in the justice system, but that’s not enough. Efforts to enhance children’s access to justice have lacked a sustained, multi-pronged and systematic approach, and children’s rights have been insufficiently embedded in justice systems,” said Mr. Alex Kamarotos, DCI’s Executive Director. The third day of the conference was a regional consultation for the United Nations Global Study on Children Deprived of Liberty. Participants from governments, civil society, academic institutions, and other practitioners met to discuss pathways leading to and conditions of detention, as well as alternatives and non-custodial measures. “The opportunity to engage with government officials and leading regional experts on deprivation of liberty across the continent during the conference has been a highly valuable contribution to the Global Study,” Kamarotos said. The full text of the Call to Action can be downloaded here.